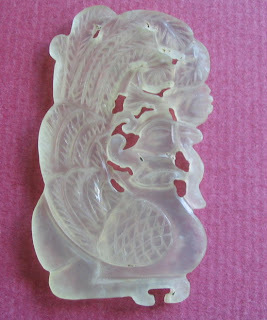 I bought a beautiful white peacock carving while touring Guiyang the capital of Guizhou Province. 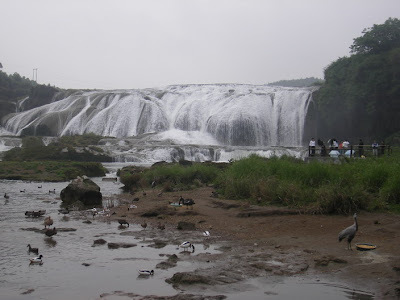 Guizhou has been condemened by many visitors as the most backward province in China, dirty and ugly. Yet I found it not so. It is a water province and so appeals to the Tao in me. It rains everday, there are waterfalls, crystals, mountains and caves and grey skies. 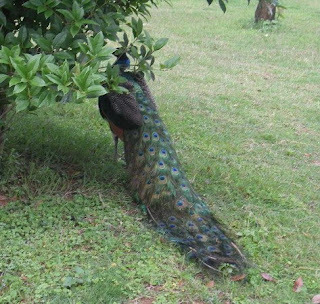 Birds are pleantiful in Guizhou, including the King of birds, the Peacock. And so it is appropriate for me to purchase this beautifully carved peacock as a memento of my trip. The material used does not look like jade, more like crystal or agate or even glass. Ahem, what sort of a collector am I who don't know an agate from a quartz ?? Anyway it is very cold to the touch and white and translucent as ice. The tail fans up elaborately and the details are finely etched. There is an eye somewhere tucked among the feathery tail. This is a unique piece for me as I have not seen a "yu" (any kind of stone)peacock carving before and a first in my collection. I think its inspiration comes from the many peacocks in Guizhou Province. And so thanks Guiyang for your snowy white peacock.